Music is the medicine for all your worries and stress. Jump high, stretch yourself and dance to the beat of your favorite artists. Music festivals give you the opportunity to just let go of everything and be yourself. We love to go to music festivals. The beats, the dancing, the singing, the sweating. Music festivals are exciting, but we can’t just dance all day and all night. We’ll need to take a breather. And what better way than to relax in your hammock. Hammocks have always been a part of music festivals. 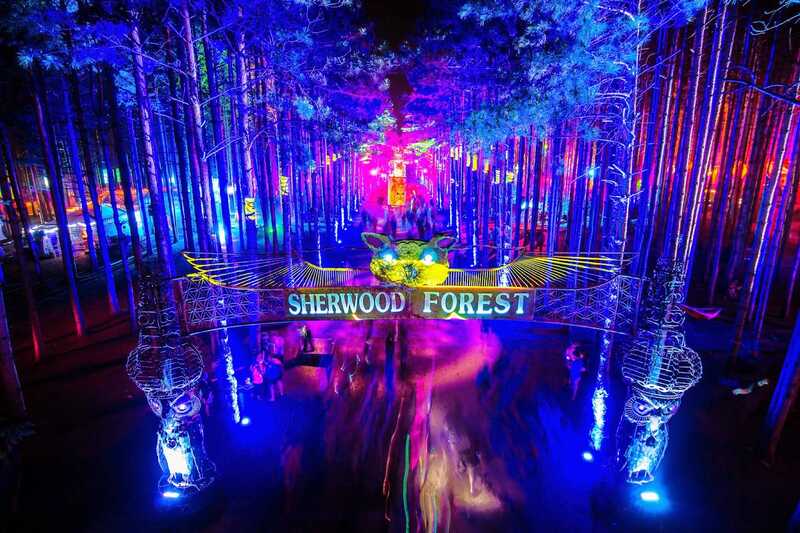 With the rise of multi day festivals and camping festivals such as Electric Forest and Coachella this is a better time than any to enjoy the sounds of your favorite artists from the comfort of your hammock. 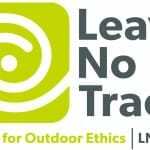 Before we jump into the pros and cons of hammocking at a music festivals, let’s follow some leave no trace principles and be respectful of the environment and others. On that same note, look for already established campgrounds or hammocking spots. Please don’t break off branches or disturb existing plants to set up your camping hammock. “Good campsites are found, not made”. Serac ultralight camping hammocks always come with a set of tree huggers. The wider surface area of the tree straps protect tree bark from the force of you and your hammock. Never use rope when hammocking, or any thin material that will cut through tree bark. For your own safety, don’t hammock from dead trees! Or risk hurting yourself if they collapse. It’s tough to gauge the holding capacity of dead trees, so never attempt to hang from them, or even trees with dead branches above you. When you’re all done, be sure to pack everything out and leave the site the way you found it. Make sure all trash and garbage is taken with you before you head out. Comfortable! Being able to relax outdoors (or indoors) in your hammock is one of the simplest joys in life. The gentle swaying of the hammock puts your mind at ease and allows you to be fully aware of your surroundings. What better way than to kick back and enjoy the sounds of the festival. If you get yourself a double hammock, you can even share your experience with another. Although we don’t recommend sleeping 2 people in a double hammock. They’re great to hang out in. Set up in seconds. I don’t think there’s a shelter easier to set up than a hammock. You find 2 trees, throw your tree hugger straps around them and clip the carabiners on. There you have it, a perfect hammock set up! It’ll take a few minutes at most. They are durable and reliable. Even with 2 people on a Serac Hammock, you’ll never get the feeling that you’ll fall through. With a weight capacity of 350lbs (and probably more), you never have to fret. You’ll be safe and sturdy. If you’re convinced, then lightweight nylon camping hammocks will be perfect for you. 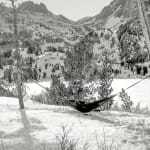 Some popular brands are Serac Hammocks, Eno Hammocks, Grand Trunk Hammocks and Hennessy Hammocks. Like we mentioned, you may even want to consider a double hammock. 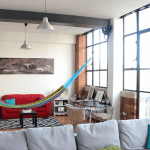 Double hammocks have more nylon material making it wider and roomier. Enough room for two! Though single hammocks pack down smaller, and are more portable and compact. How do you choose the perfect hammock? If the festival happens to be in a very buggy area, and you want some protection, you can always opt for a bug net hammock or buy a separate bug net. Learn more about bug free hanging. You can also get festive with your hammock. Use battery operated twilights which can be hung from any part of your hammock, even the bug net, and gives you the illuminating affect while you have fun listening to your favorite songs. 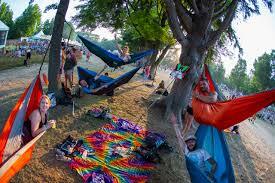 After bringing your hammock to a music festival, you’ll never go to another one without it. You’ll be addicted for life. This entry was posted in Equipment, Hammock Uses and tagged benefits, Camping, festival, Leave no trace, music, suspension, ultralight, uses.